I am, as a general rule, suspicious of books whose central premise relies on putting real people in contrived situations that never happened. So Alan Bennett’s book about Queen Elizabeth becoming a bookworm gave me pause. It seemed too gimmicky, too clearly engineered to garner the affections of bookish Anglophiles everywhere. And cutesy comic novels often don’t sit quite right with me. But then Jenny talked about the sadness in it, and I thought perhaps there was more to it than the premise suggested, so I added it to my list. I am delighted to report that I enjoyed every bit of it. The book starts out much as I expected. Queen Elizabeth is walking her corgis when she encounters a mobile library on the palace grounds. She takes out a book by Ivy Compton-Burnett out of politeness, and although she finds this first book hard going, she then ends up taking out a Nancy Mitford, again out of politeness. From then on, she is hooked. She starts taking a book with her everywhere she goes, getting irritated at interruptions to her reading, making a TBR list, and generally doing all the things that so many avid readers do. She even stops paying attention to her wardrobe, and her former habit of punctuality becomes a thing of the past when her books start to become more appealing than yet another public appearance. I could naturally see much of myself in the queen’s behavior, and I got a lot of chuckles out of that sense of recognition. But this book really isn’t entirely about the pleasure of reading. Bennett isn’t writing a chipper little salute to literature. The queen’s reading opens her mind in many ways and brings her great pleasure, but such an all-consuming passion also brings complications. These complications are to some degree the stuff of comedy, but not entirely so. Reading changes the queen—it changes her relationships and the way she sees the world. She gains a great deal, but loses something too. Listening to this book got me thinking about my own reading. I’ve had many of the same experiences as the queen, both the comic and the not so comic. I’ve arrived late or failed to spend adequate time on my hair because I was too absorbed in a book. My love of reading has kept me from pursuing my interest in photography to the degree that I would like. Like the queen, I’ve learned a great deal about other people by reading, but I’ve also sometimes chosen reading a book over calling or sending a note to a friend or family member who might like to hear from me, which means my books have kept me from actively demonstrating the sympathy that I’ve learned to feel in part because of my books. So you see the conundrum. Bennett’s version of the queen faces a similar sort of balancing act, and I was fascinated to see how she juggled her shifting priorities and how her priorities continued to change over her reading life. The audiobook was read by the author, Alan Bennett. It took a couple of chapters for me to get used to his voice, but once I was hooked, I was hooked. And I was pleasantly surprised and delighted to find that this little book, perhaps easily dismissed as a trifle, has a richness beyond my expectations. This entry was posted in Audiobooks, Contemporary, Fiction. Bookmark the permalink. Thanks for the recommendation. I’m definitely interested in exploring more Bennett. I read this a couple of days ago and like you, was thoroughly charmed! I especially like how much the Queen is aware of the disadvantages of coming later in life to a literary education. The Uncommon Reader was one of my favorite books read last year. I went on to listen to Bennett read his The Clothes They Stood Up In – also wonderful, but totally different. I highly recommend it. I’ll look that one up. Thanks for the suggestion, JoAnn. I hadn’t heard of it, but I’m becoming a Bennett fan I think–I also love The History Boys. I too enjoyed this story very much though I read it with reluctance, thinking of it as light reading or fluff. But it was a fun story and as you said, brought out some interesting aspects of book lovers. Thanks for reviewing it. It really isn’t as fluffy as I expected, but it still had the fun that I was hoping for. I read this about two months ago and liked it very much! I am glad you enjoyed this. It is one of my favorite books. And I love listening to Alan Bennett read his stuff. I think he is such a clever writer. He can really capture nuance–and humor. I think it could easily become a favorite for me. I’m putting it on my mental list of “books I’ve read that I want to buy” for my next Daedalus or Green Valley Book Fair excursion. Oddly enough, this book reminded me somewhat of a completely different book–and that one not even fiction: Jane Smiley’s THIRTEEN WAYS OF LOOKING AT A NOVEL, in which she writes thirteen essays about thirteen different novels. One of the things I got from Smiley’s and Bennett’s books is the difference reading makes in our perception of things: how we cannot go back and unread a book; how, once we have read a book, it stays with us (whether we want it to or not), and we adjust our worldview accordingly. In other words, being an avid reader is not an unalloyed pleasure, but we really couldn’t change our reading habits (addictions?) even if we wanted to–which, of course, we don’t. I’ve only read one of Smiley’s books (Duplicate Keys) and hadn’t heard of that collection, but it does sound worth looking into. That’s an interesting point too about not being able to unread a book. I have a terrible tendency of forgetting details about books almost as soon as I’ve read them (and blogging has helped correct that), but I wonder if the ideas behind the book end up seeping in anyway. Something to think about, definitely! This has been on my wishlist for some months, because I remember both Jenny and Ana (I think?) writing very lovingly about it. And now you’re added to the list of people who recommended it. It is interesting that the book raises so much of the issues readers often face. Especially the not caring about your looks because you’re reading until the very last moment (or in my case sometimes not caring enough about that presentation because the book you’re reading is so exciting). I think one of my favorite part had the queen learning how to wave while reading, which also resonated with the whole putting books before everything else, hair, presentations, cooking dinner, etc. 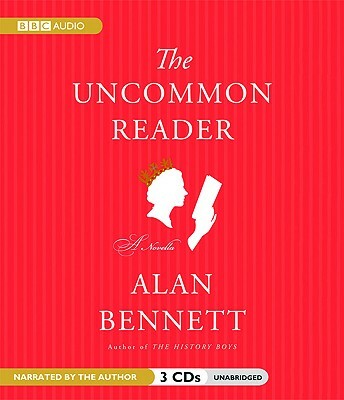 I read the normal book of the Common Reader and loved it, but being a huge fan of Bennett is general I love to listen to his voice. You should hear him read Winnie the Pooh – his Eeyore is perfection – when my daughter was younger, those CDs accompanied us in the car for ages. I had never heard his voice before, but I can totally imagine how he would make a perfect Eeyore. I loved the audio, but I’m looking to get a print version for my permanent collection if I run across one in a bargain hunt one day. Charming–I’m quite glad it deals with both the negative and positive sides of reading instead of simply relying on its quirkiness. That mix really took me by surprise. And I should have known Bennett would get at something complex because The History Boys was much the same, turning inspirational teacher story on its ear. On CD it’s only three discs long, so it’s not a huge investment of time. I think you’d enjoy it, Amanda, especially given a lot of your thoughts lately about balancing reading with other things. It definitely demonstrates how quickly and easily an imbalance can occur, but without exactly saying we need to be balanced. It celebrates it, really, but that celebration has an edge to it. At first I was surprised by how small the actual book was and then I was delighted by how big the ideas were in it. It was definitely one that lived up to the hype for me — which is becoming increasingly rare. I love the way you describe it, Kristen. A small book with big ideas. I really enjoyed this when I read it. It was light, when it would have been so easy to make comic heavy weather out of the premise. It made me keen to read more Alan Bennett – he is very well regarded in the UK, but for some reason I had held back from his work. Given he writes a lot of scripts and script-like work, I would think you might appreciate some of his theatrical pieces, Teresa, like Talking Heads, for instance. I’m definitely going to look for more Bennett. He’s not terribly popular over here, but I think a lot of people read this particular book. And one of the theatres in DC did a wonderful production of The History Boys. That play was talky enough that it would make a good read, and it has a lot of interesting material in it about education, which I imagine you would appreciate, Litlove. When I first heard about this book, I thought it sounded charming but not necessarily like a book I had to read. I do think, however, upon reading your review that it would be one I’d enjoy a good deal, and would certainly be a lighter, quicker read than many of the other books I do pick up. It sounds like it would be perfect for those times when one goes through a reading slump. It would be great for getting out of a slump. Light and easy without being simplistic. I had eye-surgery back in April and this was one of the audiobook that got me through the book-ban. Unlike you, I got into his voice from the start. Do you think the Lady in question has read the book? Oh yes! The Hardy reference! Any book with a Hardy reference is doing something right :) And such a clever reference it is. I did read somewhere (but can’t remember where) that the Queen read the book and said that she liked it. It definitely wasn’t as simplistic and precious as I expected it to be. Very satisfying. I just finished listening to this one and shared many of your reservations going in [though I have to say I loved Sue Townsend’s funny royal novels]. I was skeptical of the author reading it–remembering in horror trying to listen to the sequel to “A Wrinkle in Time” being ruined by the author’s read. Instead, it was perfect! The author really did give voice to his characters. Ala the diarist at the Spoof, he gets Prince Philip just right, too! “Ginger Stick in Waiting” indeed!! lol……. This was delightful and the author can be forgiven for getting it”backwards” on a “A King’s Story,” which told exclusively of Edward VIII’s life BEFORE his marriage! Most American’s might miss the humor in “Sir Kevin,” but just known that “Kevin” is NOT a name found often at Eton or Harrow–i.e., not one of “us” and definitely not a name found often in the Household! I’ve never heard of the Sue Townsend novels. I’ll have to look those up. Author reads can go either way, can’t they? Another author’s audio reading that I liked was Ian McEwan’s On Chesil Beach. But Barbara Kingsolver’s voice in Animal, Vegetable, Miracle got on my nerves. Yay! You’re a convert! I loved this book when I read it. How fun to have Bennett read it. Definitely a convert. I’m so glad I finally read it! I loved this book! It’s a clever little read that packs a big punch.